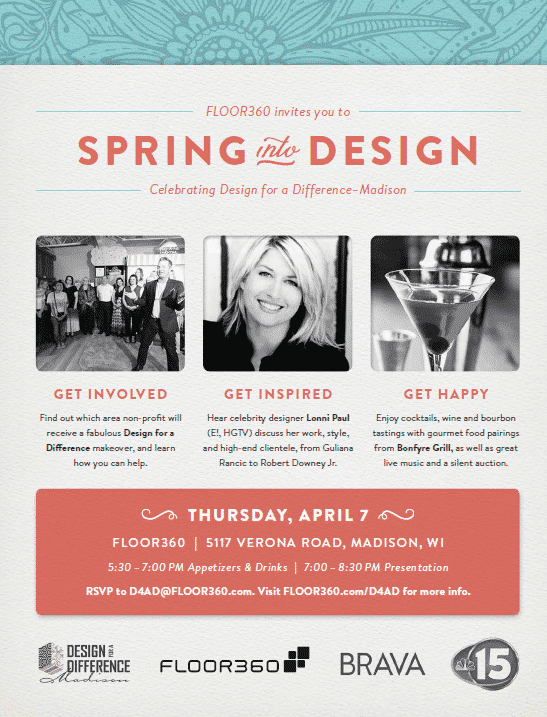 FLOOR360 has sponsored four interior makeovers of non-profit facilities in the Madison, WI area since 2015. The total value of all the makeovers exceed one million dollars in value. We couldn’t do it without the support of our design team, team members, supporters, sponsors and donors. Please take some time to look at the emotional videos and review the list of contributors. A majority of partners that participated in the 2017 makeover are listed with contact information in our Preferred Partner Directory. If you are interested in getting involved contact Angela Skalitzky Design for a Difference Project Manager for Madison, and Design for a Difference National Ambassador today [email protected] or 608-204-7538. The East Madison Community Center was established in 1966 to promote educational, recreational, and community activities for all citizens in its service area. EMCC strives to enhance the opportunities of as many individuals and groups as possible, with the assistance of public and private funds, and with the support of paid and volunteer staff. The EMCC serves over 4,400 individuals each year throughout its diversified programming options. The 2017 Design for a Difference Makeover of Centro Hispano is now complete! The estimated value of the makeover is over $600,000 in demo, donations, labor, materials, painting, furniture, design, installation and staging. We can comfortably say this makeover is among the largest makeover of a non-profit in the United States in terms of value and interior square feet. This page contains an overview of the 2017 Design for a Difference makeover of Centro Hispano. Please take some time to view our 2017 Progress Updates with photos and videos that feature a few of the 38 local design professionals who have volunteered their own time since April 2017 to meet and plan this makeover. Watch the video and meet some of the key people who work at Centro Hispano to provide crucial services to the Madison community. Finally, this whole project is made possible by over 100 partners and donors who have supplied a combination of funds, materials, labor, promotion, project management, and skills. A comprehensive list of individuals and businesses who contributed to this project are listed below. At Centro, we are moving ahead in ways we could never have before because of the gift you gave us. People are actually wanting to rent our space to have meetings and gatherings! This is an unanticipated additional stream of revenue for us – as a result we revised our rates and our rental policy so we can better manage the use of space. Each and every day I have a moment that reminds me of the tremendous gift you gave us – a passing comment from a visitor about how beautiful my office is, and have you seen the pictures from the events we have had this year? Stunning. Life has changed in so many ways for us here, and much like a new home where it takes about 6 months to settle in, we are just now beginning to settle in to the space that was almost too beautiful to be true at first. Programs are running full swing, children are playing on soft floors and carpets, cooking demonstrations are happening weekly in our kitchen, and our general wellbeing as a team has grown tremendously. Thank you so much for this incredible gift. So meaningful on so many levels and with an impact that will be felt in the many years to come. I have to say that in my 6+ years in this profession I have NEVER seen a gift that carried so much impact on so many people for such a long time. I hope this message finds you doing super well! We just hired (2) new staff! Amazingly gifted clinicians who are both bilingual Spanish speaking. They both said they knew they wanted to work at Rainbow when they walked through our doors!! Bob, I remember distinctly that you said one of the hopes of the Design 4 a Difference effort was to transform the environment to attract & retain high quality staff!! Just wanted you to know we are concretely experiencing this. We had an incredible Stakeholder Forum in April & earlier this month we hosted a Downtown Madison Rotary luncheon that was also very successful. And we are continually taking groups through for tours including an Edgewood college psychology class, Domestic Violence Task Force Children/Youth Subcommittee & many, many more. Alumni are also stopping by to check out the renovation & express pride & gratitude for what the community has done for us & current & future Rainbow clients. We are doing super well in fundraising & cannot thank you enough. I know you are all very busy with your current project with Centro & we are excited for them but wanted you to know how much more your gift continues to give! The other day a parent stopped by who had been referred by a different program. She has one 4 year old son and has been urged to learn more about the Respite Center from the social worker in the other program. She was very reluctant to come to the Respite Center since she does not leave her son with anyone. However, as soon as she came into the Respite Center, she gasped with happiness and delight. She was amazed by the beautiful space and looked in every room. She remarked on the details in the murals in the bedrooms. The kitchen details astonished her. She said she’d like to live here! While she looked around, her son quickly became engaged with the toys and activities that attracted him. Their tour was brief, but both the parent and the child are planning to come back again soon. Within a few minutes, she was convinced that the Respite Center was a good place for her child, and the beautiful space assured her that we are well supported by the community and a good place for children.